Although similar to the Series 3 on the surface apart from its larger screen and EKG technology, the Series 4 Watch shows some serious efforts at interior redesign, an early teardown of the device reveals. Apple is using new case and button designs, and the display is thinner, according to iFixit. The company has also optimized other components, for instance shrinking the Taptic Engine, though it is longer. In the Series 4, the Taptic Engine "clicks" as people turn the crown. The new Watch is also believed to have a relocated barometric sensor, placed inside the speaker grille. In any case the sensor no longer has a separate hole as on the Series 3. Battery-wise the Series 4 has a 1.113 watt-hour supply, 4 percent greater than the 1.07 watt-hours before. This is notable because the redesigned case is about 6 percent thinner. iFixit rates the device 6 out of 10 for repairability, commenting that screen replacements are "difficult but do-able," and that battery replacements are "pretty straightforward" once the screen is off. 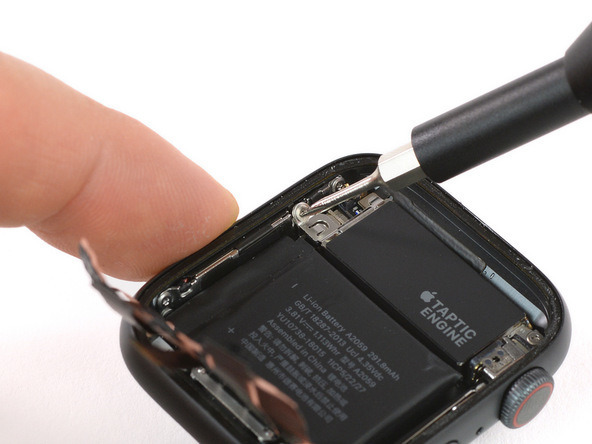 Obstacles to repairs include extremely small tri-point screws, and the Watch's S4 system-on-chip, to which some flex cables are mounted directly. Most board repairs are said to be "impossible." The Series 4 launched in a number of countries last Friday.